Last week at Web Analytics Wednesday we were treated to the outputs of the latest eConsultancy review of the analytics industry and on Wednesday this week eConsultancy is hosting a webinar on the future of agencies, so I thought that this was an opportune moment for me to add my tuppence on the situation. Hopefully Linus Gregoriadis of eConsultancy and Andrew Hood of the report sponsors, Lynchpin, will publish their presentations from Web Analytics Wednesday, but in the mean time you might find that I publish the odd graph here and there in this post (download the report yourself on eConsultancy if you are a member and there is an eConsultancy blog post on some of the data as well). 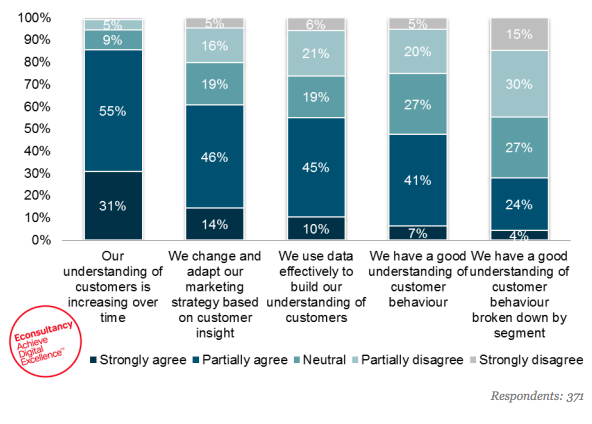 For those of you who are not au fait with the report – each year eConsultancy runs a survey of its members (and anyone else who wants to respond) where it asks them a series of questions about their use of measurement and analytics – we have 5 years worth of data now, so we can start to see the trends emerging. These research pieces are useful for those who end up in niches and want to understand the wider environment so that they can keep their eye on the skills they’ll need at future jobs. What I thought I’d do is give you some insight into where I have seen things change over the years and what the growth in jobs in Analytics means. There were 93 jobs being advertised in January 2011 and 119 in January 2012. Right now, in July 2015 there are 702. When I first started doing analytics in 2004 (I know, I don’t look that old, do I?) I worked in an eCommerce team that was a hybrid of marketeers and business facing digital people. My role was to do daily, weekly, monthly reports to management and out to business teams, as well as helping the business teams to understand their figures and what they could do with their marketing. My second analytics role in 2005 was in an eCommerce team that was mostly front end development, design and database management. My role was of reporting, setting up analytics systems, working with database developers to understand customer patterns and making recommendations on conversion rate improvement. My third analytics role in 2007 was in a search marketing team, where I was tasked with setting up a new tool, training others in the organisation on how to use the tools, reporting to the board, making recommendations on improvements (either to increase volume or conversion) and working with the search team to get more targeted traffic. My fourth analytics role in 2009 was in an eCommerce team whose primary function was to report customer insight, but also to train others on how to use the tool, making changes to the tagging and doing data modelling to set targets (we’d call it predictive analytics these days). Then I decided to go and work for an agency, which I have done for a couple of companies, before setting out on my own in 2014. In 2010 I believed this because every job I had worked in had required me to be a generalist – someone who could do everything because there was nobody else (or there were a couple of you and you shared it). Analytics teams of more than two were a thing of the distant future. In 2015, I’m not so sure you need all of that. I don’t think anyone will ever take the route through to their current role that I did. If you start in a specialist search role, you aren’t going to ever need to know how to do tagging or teach people how to use tools. If you started in a tagging world, you probably won’t need to know the intricacies of each type of marketing. If you come from the business side, then you don’t really need to understand databases or the specifics of each type of marketing. Because of this, the generalist web analytics professional is a dead career. But that would always be ok whilst there are analytics agencies out there, because you can trust that the agency side would still need these people to do whatever they can for the company they’re working for. The companies who used to service the analytics needs have moved up market to attract companies willing to pay the rates of management consultancies (or become management consultancies) – if you are charging £1k+ a day, why bother with small 5 day jobs? We’ve seen a ‘scope creep’ from agencies who used to be on the periphery, who now offer those services, whether they be the full service agencies offering advice on data, marketing services companies offering advice on tagging, media agencies giving reporting advice, etc, etc. If you work in house, how many times has an agency offered a service that you thought as a bit out of their range? There has been a massive increase in the number of full time, short term contracts in house. This is a result of organisations realising that they need more than one or two people in the analytics team (Tesco now have 30-odd full time analytics people). Do not fear dear reader, there is still a role to be played by a generalist, so I’m not going to go away any time soon (since I went out on my own I’ve done some work doing measurement frameworks, some work setting up analytics, some work in SEO, some work doing data analysis, some work doing tagging and some work sitting in tag manager tools). There are still some companies out there who don’t have a full time employee but who aren’t using an agency or had an existing agency scope-creep into the role. If you are looking for a generalist to come and start Web Analytics at your organisation – there are are still a few of us out there – don’t be afraid to ask for someone to do a couple of days a month! Final point – there are also a bunch of really nice people in this industry who you can ring up for a ten minute chat who will point you in the right direction without having to pay them. Don’t be afraid to do that!